1. What is the enthalpy change for reaction 1? 2. If reaction 2 were repeated at a higher temperature, how would the reaction’s value for ΔG be affected? (A) It would become more negative because entropy is a driving force behind this reaction. (B) It would become more positive because the reactant molecules would collide more often. (C) It would become more negative because the gases will be at a higher pressure. (D) It will stay the same; temperature does not affect the value for ΔG. 3. Under what conditions would reaction 3 be thermodynamically favored? (A) It is always favored. (B) It is never favored. (C) It is only favored at low temperatures. (D) It is only favored at high temperatures. 4. If 64 g of CH4O were to decompose via reaction 4, approximately how much energy would be released or absorbed? (A) 65 kJ of energy will be absorbed. (B) 65 kJ of energy will be released. (C) 130 kJ of energy will be absorbed. (D) 130 kJ of energy will be released. 5. Which of the following is true for all of the reactions? (B) If completed inside a sealed container, the pressure will decrease as the reactions go to completion. (C) The activation energy for all four reactions will decrease with increasing temperature. (D) More energy is released when the bonds in the products form than is necessary to break down the bonds of the reactants. The reaction above is not thermodynamically favored under standard conditions, but it becomes thermodynamically favored as the temperature decreases toward absolute zero. Which of the following is true at standard conditions? (A) ∆S and ∆H are both negative. (B) ∆S and ∆H are both positive. (C) ∆S is negative, and ∆H is positive. (D) ∆S is positive, and ∆H is negative. 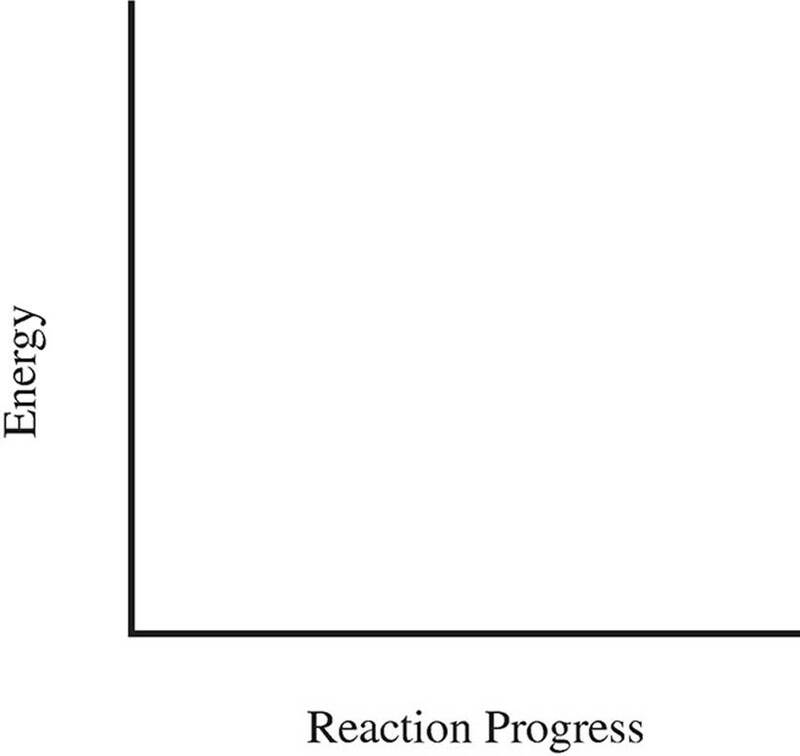 Which of the following is true of the reaction shown in the diagram above? (A) The reaction is endothermic because the reactants are at a higher energy level than the products. (B) The reaction is endothermic because the reactants are at a lower energy level than the products. (C) The reaction is exothermic because the reactants are at a higher energy level than the products. (D) The reaction is exothermic because the reactants are at a lower energy level than the products. 8. How does the addition of a catalyst affect the overall energy change of a reaction? (A) Catalysts make reactions more endothermic as they help break the bonds of the reactants. (B) Catalysts make reactions more exothermic as they add energy to the system. (C) Catalysts reduce the energy change in the reaction to zero. 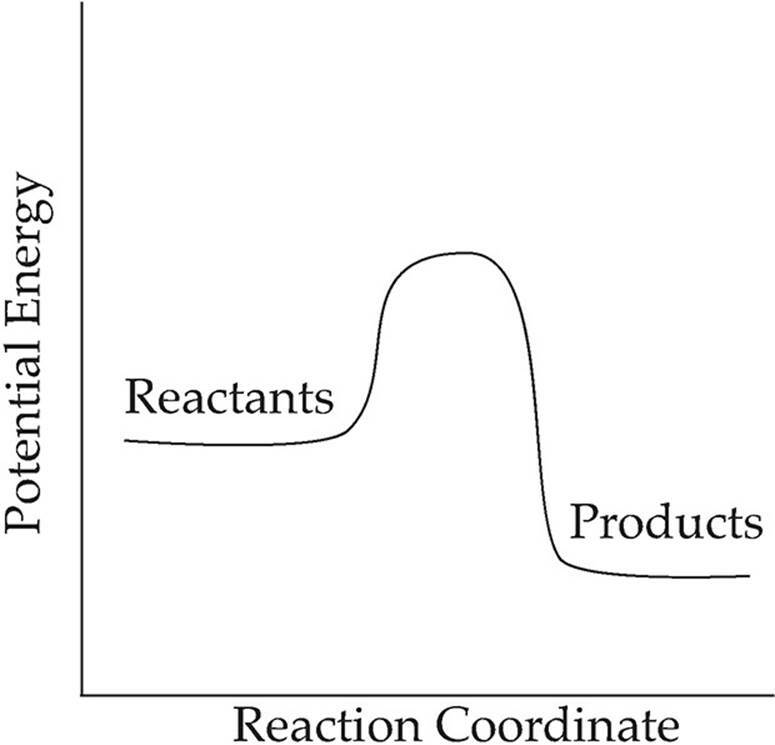 (D) Catalysts have no effect on the overall energy change of a reaction. Based on the information given above, what is ∆H° for the following reaction? Is ∆S positive or negative for the above reaction, and why? Based on the information given in the table below, what is ∆H° for the above reaction? Which of the following is true for the above reaction? (A) The value for ΔS is positive. (B) The value for ΔG is zero. (C) The value for ΔH is negative. 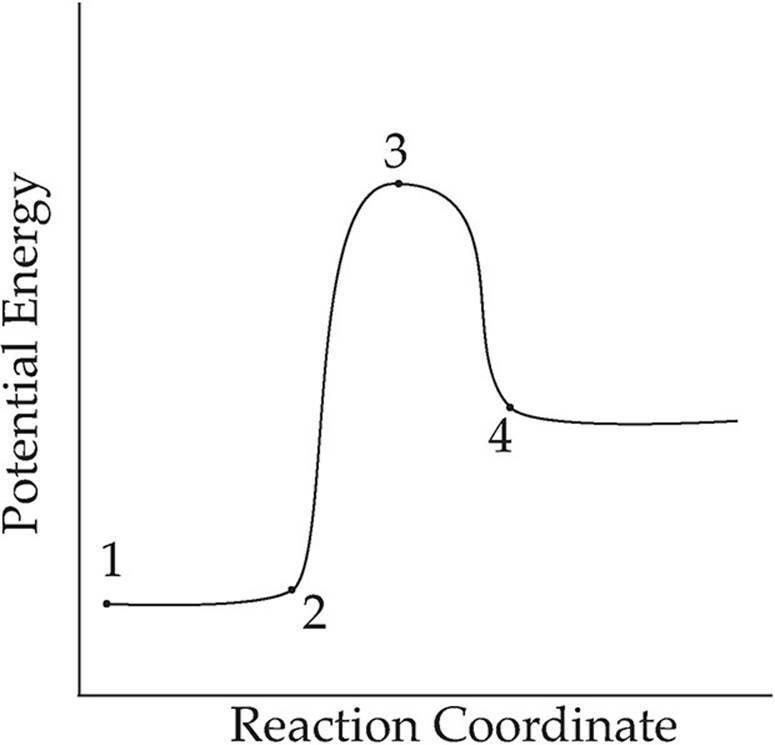 (D) The reaction is favored at 1.0 atm and 298 K.
Which point on the graph shown above corresponds to activated complex or transition state? 15. In which of the following reactions is entropy increasing? Which of the following correctly identifies the values for ∆G, ∆S, and ∆H? Gaseous hydrogen and fluorine combine in the reaction above to form hydrogen fluoride with an enthalpy change of −540 kJ. What is the value of the heat of formation of HF(g)? At room temperature, which of the following is true? (A) ΔG and ΔH are positive; ΔS is negative. (B) ΔG is positive; ΔH and ΔS are negative. (C) ΔG is negative; ΔH and ΔS are positive. (D) ΔG and ΔS are negative; ΔH is positive. Based on the information given above, what is ΔH for the following reaction? Energy is released when glucose is oxidized in the following reaction, which is a metabolism reaction that takes place in the body. The standard enthalpy change, ΔH°, for the reaction is −2,801 kJ/molrxn at 298 K.
(a) Calculate the standard entropy change, ΔS°, for the oxidation of glucose. (b) Calculate the standard free energy change, ΔG°, for the reaction at 298 K.
(c) Using the axis below, draw an energy profile for the reaction. (d) How much energy is given off by the oxidation of 1.00 gram of glucose? The standard free energy change, ΔG°, for the reaction above is −801 kJ/molrxn at 298 K.
(a) Use the table of bond dissociation energies to find ΔH° for the reaction above. (b) How many grams of methane must react with excess oxygen in order to release 1500 kJ of heat? (c) What is the value of ΔS° for the reaction at 298 K? (d) Give an explanation for the size of the entropy change found in (c). The heat of formation, ΔH°f, of NH3(g) is − 46.2 kJ/mol. The free energy of formation, ΔG°f, of NH3(g) is −16.7 kJ/mol. (a) What are the values of ΔH° and ΔG° for the reaction? (b) What is the value of the entropy change, ΔS°, for the reaction above at 298 K? (c) As the temperature is increased, what is the effect on ΔG for the reaction? How does this affect the thermodynamic favorability of the reaction? (d) At what temperature can N2, H2, and NH3 gases be maintained together in equilibrium, each with a partial pressure of 1 atm? The reaction above is thermodynamically favored at standard conditions at 298 K.
(a) Predict the sign of the entropy change, ∆S°, for the reaction. Explain. (b) How would the value of ∆S° for the reaction change if the product of the reaction was H2O(g)? (c) What is the sign of ∆G° at 298 K? Explain. (d) What is the sign of ∆H° at 298 K? Explain. The reaction above is thermodynamically favored at 298 K, and the heat of reaction, ∆H°, is −178 kJ/molrxn. (b) What is the sign of ∆G° at 298 K? Explain. (c) What change, if any, occurs to the value of ∆G° as the temperature is increased from 298 K? (d) As the reaction takes place in a closed container, what changes will occur in the concentration of CO2 and the temperature? (a) Given that the specific heat of water is 4.18 J/g·°C and assuming its density is exactly 1.00 g/mL, calculate the heat gained by the water. (b) Calculate the specific heat of aluminum from the experimental data given. (c) Calculate the enthalpy change for the cooling of aluminum in water in kJ/mol. (d) If the accepted specific heat of aluminum is 0.900 J/g·°C, calculate the percent error. (e) Suggest two potential sources of error that would lead the student’s experimental value to be different from the actual value. Be specific in your reasoning and make sure any identified error can be quantitatively tied to the student’s results.